"Snake? SNAAAKE?! It's your roll." You too can make this ill-conceived attempt at a joke with the forthcoming Metal Gear Solid-themed edition of classic strategy board game Risk, a game not surprisingly titled Risk: Metal Gear Solid. Board game maker USAopoly—makers of Risk: Halo Wars!—will bring the military conflicts of Metal Gear to tabletops, seemingly borrowing the aesthetic and Private Military Contractor themes of Metal Gear Solid 4: Guns of the Patriots. Metal Gear creator Hideo Kojima tweeted about the existence of the new board game at Comic-Con today. 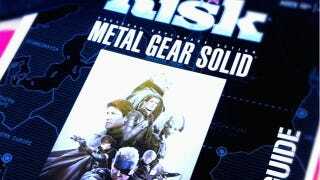 Konami reps tell Kotaku that Risk: Metal Gear Solid is not officially announced just yet, nor was the game playable at Comic-Con. All USAopoly and Konami brought to the convention was an empty box and the promise of more to come. Konami reps told Kotaku that we'll hear official details on Risk: Metal Gear Solid in the next two weeks.